Camping, caravanning, motorhomes and boating can be fun activities for all ages. 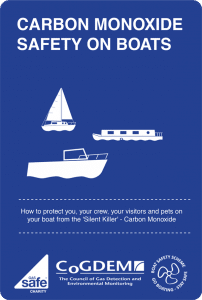 In order to ensure you have a safe time away, below are some very useful articles from the Boat Safety Scheme and the Camping and Caravan website on carbon monoxide safety. Boat Safety Scheme – Go boating stay safe – click here to read the article. We would advise that whether you are camping, caravaning, motorhoming or staying in hotels, b&bs, or rented accommodation, please take an audible carbon monoxide alarm (BS EN 50291-2) with you, it could save your life! A barbecue is almost an essential item for most campers. Not only does it provide us with an inexpensive meal that we are able to cook for ourselves close to our tent but gives the aspect of fun that once came from roasting marshmallows on bonfires. However, like other carbon burning appliances, care must be taken when using a barbecue, It is particularly important to remember that a barbecue – even one that is cold to the touch – should not be brought into enclosed areas of a tent. 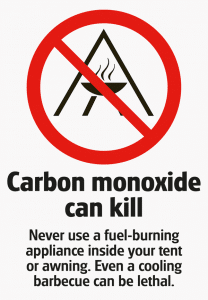 Care must also be taken with cookers, fridges, heaters and lamps used by some in camping, caravanning and in motorhomes. Please go to the Camping and Caravanning Website for all the latest information on carbon monoxide safety relevant to these pursuits.